I spent a great deal of my time, as a Musqueam artist trying to revive traditional Coast Salish art in an attempt to educate the public to the fact that there was another art form indigenous to Pacific Northwest. My earlier work is very traditional, today, I experiment with contemporary mediums & themes, incorporate my ancestral design. Susan began her artistic career in January 1981 designing and creating gold/silver jewellery. At this time, Coast Salish art was an almost lost art form (due to European contact) therefore much of the native artwork produced and sold through various galleries and museums consisted of northern First Nations art. Eager to learn more about her own peoples art style, Susan chose to concentrate on the traditional designs and elements created by her ancestral artisans. 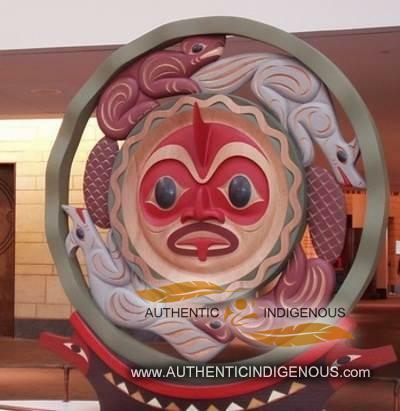 Through research and consultation with various museums and libraries (both in Canada and the U.S.), Susan began her study on the design and art style of traditional Coast Salish artifacts. Consulting with her uncle, Professor Michael Kew, at the University of British Columbia, who focused in “Coast Salish Art and Culture”, Susan then began her career as a Coast Salish artist (representing “all” of her Coast Salish peoples) creating designs reflecting traditional images of the past in jewellery, limited edition serigraphs, and paintings … taken from the spindle whorl which is a disk, elaborately carved, which was used in the spinning of wool by Coast Salish women. Coast Salish women have used the spindle whorl for centuries to spin their mountain goat wool into yarn. The oldest whorls discovered by archaeologists were carved from stone. Shell, bone, and whale vertebra were also used, but wood became the most common material from which they were made. Spindle whorls consist of a circular disk and a center pole. They came in various shapes and sizes; the size of the disk and the center pole determined the thickness of the diameter for the strands of yarn. Ironically, although Susan researched and tried to understand the art style of her ancestors, her very first two-dimensional image using the silkscreen process was a “contemporary” print entitled “Salmon”. 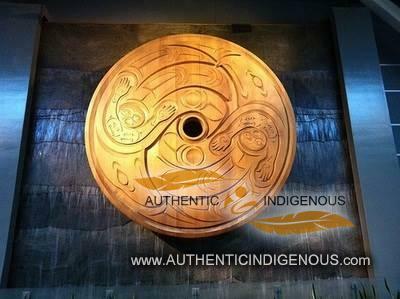 Over the past 3 decades, Susan has been instrumental in re-establishing Coast Salish art both in Canada and the United States … drawing inspiration from the images of her ancestors and commencing the use of non-traditional materials and techniques in paper, glass, bronze, wood, concrete, polymer, stainless steel, and cast iron; Inspiring a whole new generation of Northwest Coast artists. 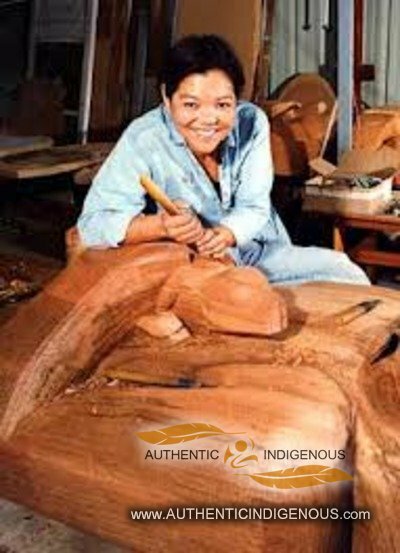 Susan’s biggest reward has been the opportunity to meet elders and teachers from other communities around the world, and to see the current renaissance in Coast Salish art and culture. 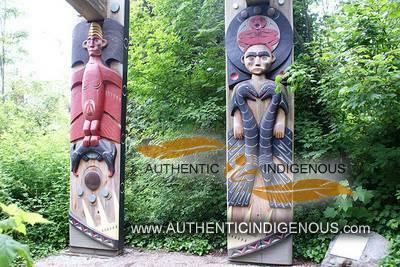 As a result of Susan’s willingness, drive, and love of experimentation, she has been awarded numerous public art commissions, including building facades and large sculptures in Canada and the U.S. To name a few, these large scale works welcome visitors at the Vancouver International Airport, Stanley Park in Vancouver, B.C., the National Museum of the American Indian in Washington, D.C., the U.B.C. Museum of Anthropology as well as numerous public buildings and corporate developments paying tribute to the native peoples that once inhabited these lands as well as all peoples from the four corners of the earth (past, present and future) who also share and inhabit these same lands. Susan also has collections worldwide in various museums as well as within homes of private clientele. For Susan’s hard work over the years, in educating all people on Coast Salish art, which is unique to the lower mainland of Vancouver, the southern tip of Vancouver Island and the North Coast of Washington State, she has been awarded the Order of Canada, Queen Elizabeth II Diamond Jubilee Medal (to mark the 60th anniversary of Her Majesty’s accession to the throne), in addition to a National Aboriginal Achievement Award, a YWCA Woman of Distinction Award, a B.C. Creative Achievement Award, appointed to the Royal Academy of Arts, was elected to the International Women’s Forum, and has received four Honorary Doctorates from the University of Victoria, Simon Fraser University, University of B.C. and Emily Carr University of Art and Design.